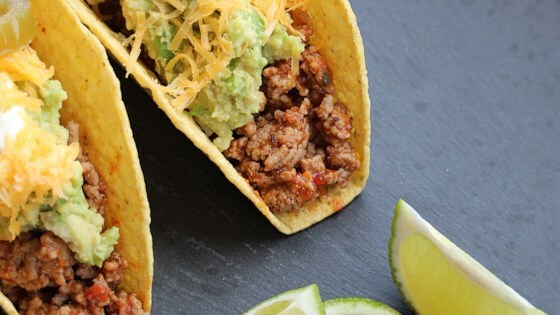 "My mom's beef tacos get a makeover with ground turkey. These are much healthier, easier, and faster because there is no grease to contend with and I think they just taste better." Preheat a large skillet over medium-high heat. Add turkey; cook and stir until browned, about 5 minutes. Add tomato sauce, water, green chile peppers, onion, taco seasoning, and garlic; simmer, stirring occasionally, until thickened, about 30 minutes. Spoon turkey mixture over tortillas. Top with lettuce, Cheddar cheese, tomatoes, green onion, cilantro, and sliced olives. Substitute fried or warmed corn tortillas for the flour tortillas if desired. Why use flour tortillas when corn tastes ever so much better? Flour ones always taste like raw flour. Great tasting tacos. You won't miss the fat. I added a tbsp of cornstarch because it never thickened and I needed to use corn taco shells. Thank you for the recipe. All the good ingredients could not make the turkey tasty, ugh!! !